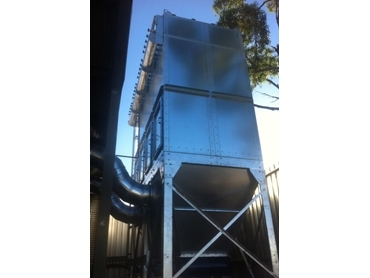 Australia's leading designer and manufacturer of industrial air pollution filtration equipment, Polex Environmental Engineering was commissioned to supply and install one of its innovative dust collectors at Beny’s Joinery Wollongong in 2012. Beny's Joinery, a well-respected and established kitchen design and joinery company in NSW needed a solution to address their concerns regarding dust and air quality within their factory. Polex engineers designed, manufactured and installed an MDC 2-4 P 45 kW unit, a large reverse pulse dust collector with 200m² of filter area and a powerful 45 kW fan. Polex’s MDC 2-4 P 45 kW dust collection system incorporates intelligent dust collection to automatically and continuously self-clean its filter bags with reverse pulse action. The snap lock quick fit/ no leakage filter bags are manufactured from industrial strength 550g/m² polyester antistatic needle felt, and fitted over galvanised wire cages. Two rotary discharge valves deposit the joinery’s collected waste directly into two 3m³ bins. The bins can be emptied without switching off the dust collector. Once the bins are full, the operator can switch off the rotary valves and wheel the bins to the truck to be emptied. The high efficiency 45 kW industrial fan in the dust collector produces 25% more air than conventional fans, resulting in significant energy savings. Each dust collector is designed to run under negative pressure so that no material passes through the fan impeller, eliminating the possibility of damage or blockage to the fan. Beny's Joinery was extremely satisfied with the performance and efficiency of the MDC 2-4 P 45 kW dust collector.